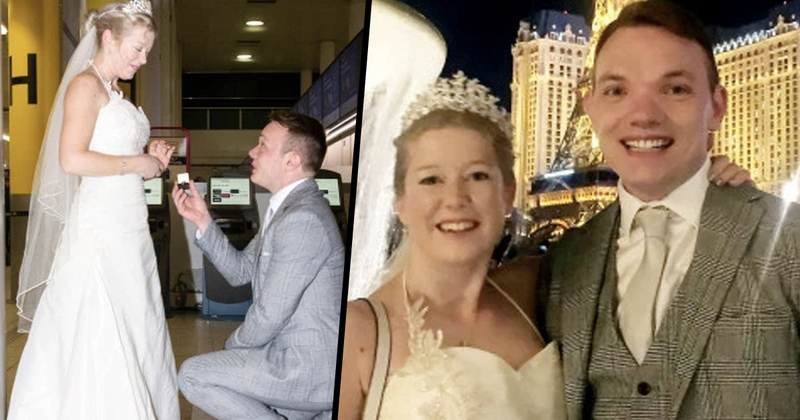 The magic of Christmas really worked on two British travellers who met at the airport before boarding a plane to Las Vegas. 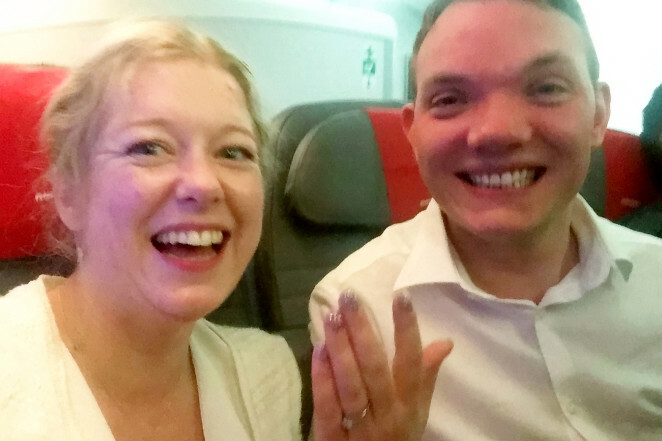 Sarah Elliot, 34, matched with Paul Edwards, 36, online and within days of knowing each other they decided to get married. The couple spoke to each other on December 22 and by the 23rd they had committed to each other and booked a wedding venue – the Bellagio Hotel and Casino. 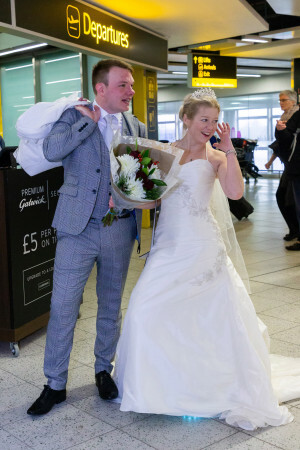 After meeting for the first time at Gatwick Airport on Christmas Eve, the pair boarded their plane in full wedding attire and jetted to Sin City to get hitched. We instantly clicked – there was an undeniable connection. I’m usually such a logical person, but all the rules have been thrown out. We’ve both tried to do things the traditional way before and it didn’t work out for either of us. 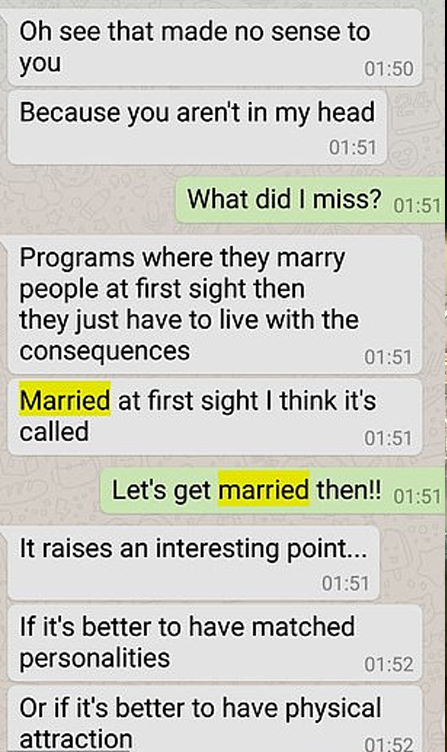 We get on so well and just thought: ‘Why not have that commitment to actually making a marriage work from the very start?’ I’m not interested in just going on dates looking for things I don’t like about that person. I’m committing to making this marriage absolutely work – like they did in the old days. It’s traditional, older generations might have only met their partner once or twice before getting married. It’s similar, we just hadn’t even met before. Paul, who works in broadcasting, met Sarah on dating app Bumble, was met with Sarah saying she already had two Pauls in her life. Apparently the third Paul is always the best and I don’t have a Sarah in my life so I guess that would make you number one. I can’t remember who brought it up, but one of us said: ‘We get on so well – maybe we should get married’. By Monday morning – three days after we’d first started talking – we’d agreed to get married. We both just thought: ‘Let’s do this’. I know it’s totally crazy – hardly any of my friends are supporting me, in fact, a lot of them are disowning me. I haven’t told my family yet. As they’re on the other side of the world we don’t talk as often as we should. Paul, from Chichester, West Sussex, has two daughters aged 13 and 15 from a previous relationship and at the time of writing is yet to tell his daughters about his whirlwind romance. Despite barely knowing each other, Sarah was intent that their marriage would work because they’re ‘completely open and honest about everything in [their] lives’. If we have any problems, we’ll talk them through. We can talk about absolutely everything – there’s nothing I’d feel uncomfortable discussing with him because I know there’s no judgment there. We talked it through – as a team – and decided we had as good a chance as anyone. By the end of the conversation, we were like: ‘We’ve got this’. We hope this one lasts!